Henley Mens Shed "In the Community, For the Community"
The Henley Mens Shed moved from being auspiced (June 2009 - Aug 2012) under the guidance and support of Wairarapa REAP (Rural Education Activities Programmes) under which it was founded in partnership with the Henley Trust (gaurdians of the Henley Leisureland Complex). 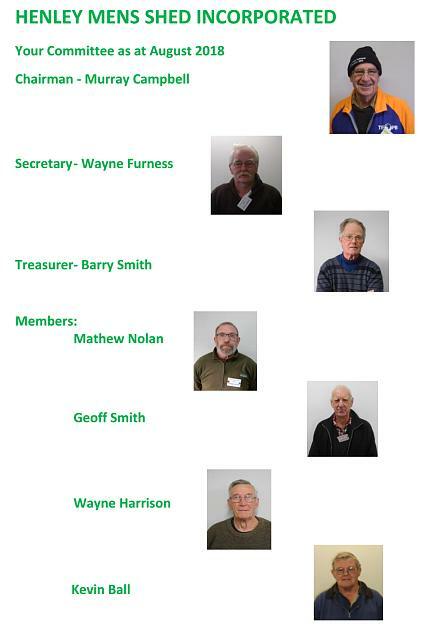 The current committee of the Henley Mens Shed Incorporated (are shown opposite) and the Shed operates under the constitution & amendments which are able to be viewed at the bottom of this page. Henley Mens Shed Inc. is a registered charitable entity - CC49434.